Achieve maximum value and optimal performance with AirMark® durable pavement markings. 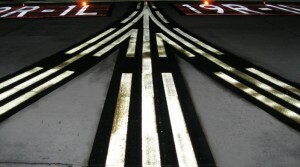 Ennis-Flint the world’s leading manufacturer and distributor of durable preformed thermoplastic pavement markings, provides a sensible solution that complements pavement marking programs with the airfield product, AirMark®. Following extensive FAA testing and applications in 7 of 9 FAA regions, AirMark® is now included in the AC 150/5370-10F. AirMark® is a specially formulated preformed thermoplastic engineered for use on taxiways, ramps, aprons, gates, and vehicle roadways as well as other areas on the airfield side excluding runways. Typical airfield marking designs include Surface Hold Position, Runway Hold Position, ILS Hold Position, Enhanced Taxiway Centerlines, Geographic Position, Gate IDs, and more. Headquartered in Thomasville, North Carolina, Ennis-Flint manufactures and distributes a complete line of preformed thermoplastic pavement marking products that are used in all 50 states, Canada, and Mexico. These products are made at Ennis-Flint’s U.S. facility which is ISO 9001:2008 certified for design, development, and manufacturing. Ennis-Flint’s commitment is reflected in proven quality and customer satisfaction for over 25 years. In addition to pavement markings for airfields, Ennis-Flint offers pavement markings for use on streets and highways, crosswalks, intersections, and parking areas, and many landside uses at airports. From lines, legends, and arrows to decorative crosswalks and detectable warnings, Ennis-Flint’s products help motorists, pilots, and pedestrians move in the right direction…safely. Other materials include traffic paint, hot-applied thermoplastic, plural components, surface coatings, markers, and more. Ennis-Flint’s market introduction has been primarily focused in North America. If you have questions about AirMark’s availability and use in other international markets, please contact Ennis-Flint. The application advantages and value of AirMark® are pronounced in multi-colored markings that are typically time and labor intensive when using other marking materials. While the initial cost of preformed thermoplastic is much higher compared to waterborne paint, the durable lifecycle performance of AirMark can result in a savings of about $5,000 for a single Surface Hold Position Sign Marking like the one shown in this photo. Typical repainting cycles range from 6 months up to 2 years. AirMark can last 8 to 12 times longer than paint. The real value of AirMark is recognized when considering the costs of mobilization, runway closures, administrative costs, and application costs every time there is a need to repaint. In August 2006, this Surface Hold Position Sign Marking was applied at Newark Liberty International Airport (EWR). This original pavement marking has withstood over 75 snow alerts and hundreds of broom and plow passes. It is still in service without any foreseeable requirement for reapplication after 5 years. AirMark® pavement markings are supplied in rolls of interconnected material that is quickly positioned onto an asphalt or concrete pavement surface and heated with a large AutoIR heater. Applications are performed only by AirMark® Certified Applicators who are active in the airfield marking industry and are committed to the highest level of service and support. Pilots and Ground Support Drivers. Retroreflective glass beads intermixed throughout the preformed thermoplastic material; as the pavement marking wears new beads are exposed for continual product performance. Three critical aspects of airfield safety management that should not be overlooked regarding pavement markings are bond, UV resistance, and retroreflectivity. AirMark is engineered with the objectives of safety, durability, workmanship, and economy.